Many people seem confused on how to incorporate LED into their treatment room, and how to charge for their new piece of equipment. Keep in mind – there are MANY different areas of the world, and some people can charge more than others based on the demographics of where they work. I personally work in a town with a population of less than 8,500 as of the 2010 Census. It is a very rural, working-class area very close to one college (Middlebury College) and a lot of farm land! 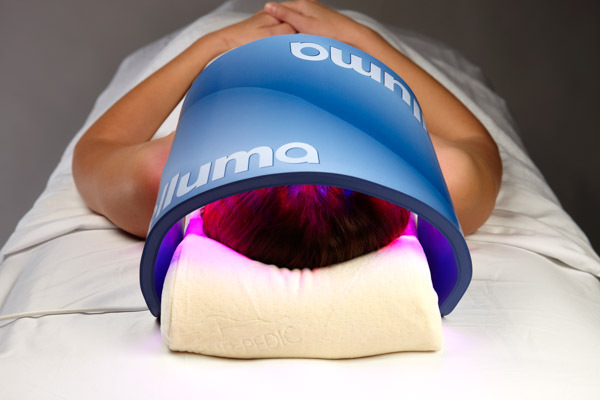 Here is how I personally use the Celluma in my treatment room. Remember – pricing greatly depends on your geographical / demographical area!!! 1. LED Facial This is the most popular of my LED services. This is what I offer for my ‘series’ when someone is coming in for addressing Acne or Aging. They’ll come for 2 LED facials a week, for 6 – 8 weeks. The first LED facial is for 45 – 75 minutes ($85 – $125+) and the other is for 45 minutes ($85+). It includes a double cleanse, exfoliation & extractions (if necessary), serums, 30 minutes LED, moisturizer & solar protection. For the 45 minute service I omit the exfoliation & extractions, unless they need it and then they are bumped to the 60 minute LED facial. No, I personally do not offer a discount on a series, but you certainly can! 2. LED panel add-on. I have 3 facials that I offer, and they’re all customized and based on the amount of time I spend with my client. I offer 60 minutes for $85, 75 minutes for $105 and 90 minutes for $125. Most clients choose the 75 or 90 minute option. I am actually very close to deleting the 60 minute option all together. The LED panel add-on is more for my monthly clients, and those that have already completed a series. They’ll add a 30 minute panel for $35+ on top of their normal facial. This gives a great ‘boost’ to their treatment, and it’s a very easy add on. 3. LED panel rental. I rent the panel for $50 / day, $150 for the week or $300 for the month. This is great for those that are either interested in completing their 2-3 treatments / week but are unable to come in OR have an acute pain issue and just need some quick relief. If they’re interested in purchasing the panel after the weekly rental I will credit the cost of the rental toward their purchase, and I’ll just sell them THAT panel and switch out my studio panel faster. The panel retails for $1595 + shipping, so keep those prices in mind when reselling the panel to your clients. You can sell them your used panel at a discount, still giving them a deal and NOT lose any money on the deal. As an aside – I also have a panel at home and I use it EVERY NIGHT! I have arthritis in my wrist (the kiss of death for an esthetician), and infrared LED helps SO MUCH with the pain! I also recently blew my knee out, so I’ve been doing nightly treatments on that as well. I can’t even begin to tell you how great my knee feels! I’ve used it on my dog after she had hip surgery, my boyfriend for his shoulder and knee and on my kids (my son recently fractured his wrist). I also use it on my face several times a week for anti-aging and pain relief (I grind my teeth at night.) My goodness – when I look back at this I realize that I’m falling apart!!! But my point is that by using it and seeing amazing results with it, I am able to sell it! The Celluma panel comes with a 1 year limited manufacturer’s warranty. I used my first Celluma for 6 months in the treatment room. Then I bought another for my treatment room & retired my original Celluma to be my rental Celluma. After 6 months I sold my rental panel to a client, shifted my studio panel to be my rental panel & bought a new one. That way I will always have the panels in my possession that are under warranty. Make sense?? When first introducing the panel really LISTEN to your client! How many times do you ask how someone is doing in your consultation and they mention an injury, arthritis or pain of some sort? When I first got my panel I would offer a free add on to their facial that didn’t have anything to do with their facial! It seems like everyone either had hurt something, or had arthritis, so I (gently) slapped the panel on them and talked about the benefits of blue, red and infrared LED. This started the conversation about how LED could help them, and offering a series just flowed easily from there.